Cremona is a city in northern Italy famous for its production of high-quality violins. 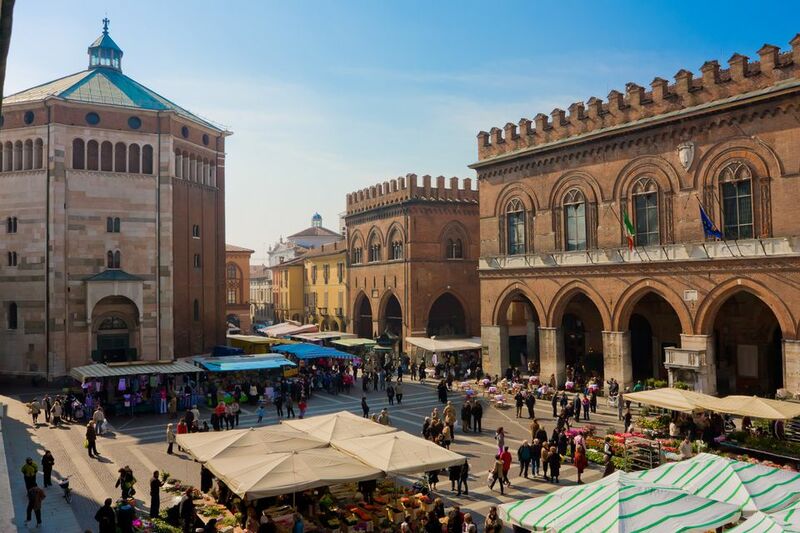 Cremona has a picturesque historic center with most sights clustered around the main square, Piazza del Comune. The city is well worth a visit and can easily be seen as a day trip from Milan but is also a fine place to spend a night or two. Cremona is a small city in the Lombardy region of northern Italy on the Po River, 85 kilometers southeast of Milan. Nearby cities to visit in Lombardy include Brescia, Pavia, and Mantova. See Lombardy Map. Cremona can be reached by train directly from Milan in about an hour. By car, it's just off the A21 autostrada. Follow the signs to Cremona and just before you get to the center there's a large parking lot (free at the time of writing). It's a short walk into the center from either the train station or parking area. The closest airports are Milan Linate, Parma, and Bergamo (see Italy airports map). Hotel Impero (reviews and booking) is a 4-star hotel about 50 meters from the Cathedral. Hotel Astoria (reviews and booking) is a central 3-star hotel near Piazza del Comune. Outside the historic center, my friends recommend Albergo Visconti (reviews and booking), a 3-star hotel that provides bicycles for its guests so they can bike to the sights. Most of Cremona's top sights are clustered around Piazza del Comune. You'll also find tourist information there. Cathedral and Baptistery: The early 12th-century cathedral, or duomo, is Romanesque in style with Gothic and Baroque elements that were added later. The facade holds many sculptures and inside the Cathedral are 14th to 16th-century frescoes and other important artworks. The octagonal Baptistery, a mix of Romanesque and Lombard-Gothic architecture, has a 16th-century baptismal font and a 14th-century wooden crucifix. Palazzo Comunale: The Palazzo Comunale, or town hall, was constructed in the early 13th century. 13th-century frescoes can be seen under the portico while other frescoes are from the Renaissance period. Inside you can see the decorated rooms of the palazzo and an exhibit of string instruments. Loggia dei Militi: Also on the main square, the Loggia dei Militi dates from the 13th century and is a good example of Lombard-Gothic architecture. Under the portico, you'll see Hercules holding the city emblem as according to legend, Hercules founded the city. Piazza S Antonio Maria Zaccaria: Behind the cathedral and baptistery is a large square that was the site of the fish market and salt warehouse. On this square is the Bishop's Palace, completed in 1817. Civic Museum Ala Ponzone-Stradivariano: The Civic Musem houses paintings from the middle ages through the 20th century, ceramics, terra cotta, archeological finds, cathedral artifacts, and a collection of 23,000 coins. The Stradivarius section is dedicated to master violin maker Stradivarius, of Cremona, and has artifacts from his workshop and a display of stringed instruments.